Dream ponies. Adorable letters that are a dream to receive! 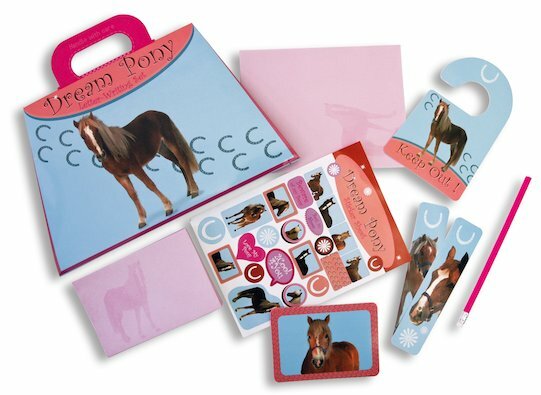 With heavenly horses making a show on notepaper, postcards and stickers, there’s plenty in here to capture every horse-lover’s heart. Meet the golden Palomino with its shimmering white tail, the glossy chestnut with a wobbly new foal, and the fuzzy little pony with the shaggy blonde mane and white blaze on its muzzle. Can you pick a favourite? Dream on! Folding carry case contains 10 sheets of writing paper, 10 envelopes, 10 colour postcards, 2 bookmarks, door hanger, sticker sheet and pencil.